Showing results for tags 'hooks'. Selling for a friend! All kinds of stuff! Selling for a friend. 1-Daiwa rig wallet 28-Leads 1-2 oz (3.08 lbs.) 1-Pack of lead inserts 1-PVA mesh 22 mm new spool 1-Small fold tackle box full of bait stops, hooks, swivels, snap swivels, Rubber stops, brown and green rubber beads, split shot. 1-Partial spool of 20 lbs. Trilene clear line 1-Cabela 40 KG scale 88 lbs with batteries 1-Swingaway can opener (like $10 if brand new) 1-Pliers 4-baiting needles, 1 is a Gardner 3-Pairs scissors, 1 is a Hardy braid scissors 1-Gardner Weigh Crook, ($28 if brand new) 3-Alarms, beginner and a couple batteries Some other tools Bait 1-K1 Anise corn 1-K1 Natural Sweet corn 1-K1 Yellow Cherry corn 1-K1 Garlic corn 1-K1 Pineapple Ice Cream corn Most over 3/4 full a couple years old but plenty moist. 30 pieces of fake corn and fake micro boilies. Mostly floating. Do not know the brand. 1-Mistral Pineapple Glug 3/4. Well over $160 worth of bait and tackle. $120 plus $17 shipping total $137 shipped any where in the Lower 48. PayPal Friends and Family. Otherwise you pay the fees. How important is it to sharpening your hooks when fishing for one bite a day or up to 3 bites on a outstanding day? So....I have caught a total of two! carp on a hair rig with an in-line NNB method feeder packed with a strawberry, corn, panko and oat mix and both fish were small. No carp on straight hair rigs with or without egg sinkers, weights, etc... Neither fish "self-hooked" like I've seen on videos, and both were caught on #4 Gamakatsu #4 octopus circle hooks. I have used eagle claw #6 straight shanked hooks with NO Carp, but plenty of catfish and turtles....To me the slack-line subtle bite sweet corn rods are out-fishing the hair rigs (poles are side-by side) 100x better...Both were hooked with the swivel tucked into the base, but I am seeing video of (mostly in England) having the swivel free, so that the pick-up is not interfered with by the weight?.......what I am I doing wrong here?....It also seems to take far longer bating up a hair rig, than the simple weight/hook line I am using.....any and all comments welcomed!! I have used barbless hooks, hooks with the barb flattened, for tying flies for many years. I do it before I tie so if the hook breaks, I'm not holding a complete fly that I can't use but need to tear apart. My reasoning: it is easier to remove from the fish and from me or you. 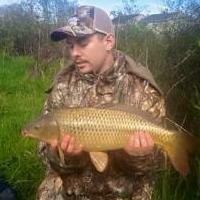 My question: does anyone use barbless hooks for carp fishing? Why or why not? Thanks.